University of Ulster divers have been passing on their expertise to maritime archaeologists in the historic Egyptian port of Alexandria. 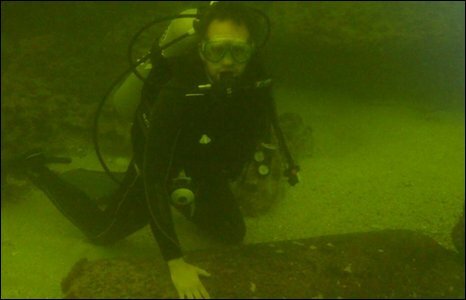 Staff from the UU's maritime archaeology centre conducted a 10-day training workshop for 15 archaeologists from north and east Africa who wanted an insight into the challenges of working underwater. During their stay the UU divers were granted a rare opportunity to explore the underwater remains of the famous Pharos lighthouse - one of the wonders of the ancient world. Work on the great lighthouse began in 290 BC and when it was completed 20 years later, it was the first lighthouse in the world and the tallest building in existence with the exception of the Great Pyramid. The course, hosted by Alexandria University's new Centre for Maritime Archaeology and Underwater Heritage (CMA), involved all aspects of survey, documentation and management of archaeological sites and artefacts from maritime environments and enabled students to gain practical experience by diving in Alexandria's eastern harbour.